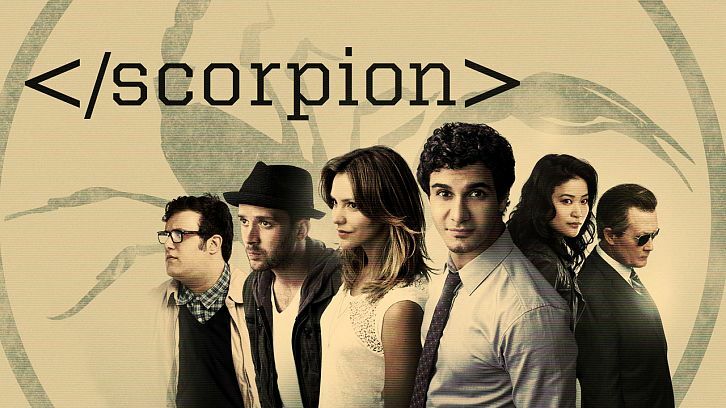 Scorpion - Go with the Flo(rence) - Review: "Withhold Judgement"
It's business as usual at the garage for Team Scorpion. Toby is attempting (and failing) to get to the root of Cabe's anxieties. Happy's building. Walter and Paige are fighting about him "solving her problem" by throwing out her beauty products and replacing them with an efficient do-it-all slurry. Patty is yelling at Sly, and Ralph is hiding out in the car from Patty, when suddenly they're hit with a horrid smell - and an unwelcome visitor. Their new neighbor, another socially inept scientist, has decided she can't work with their noise, so she's sent a rotten egg mist through the ventilation as a warning. Before the team can get the chance to plot their revenge, (or, in Paige's case, "look at her point of view"), they get contacted by an associate of their MI6 friend Gleason. Apparently a UK satellite packed with military lasers has been taken over by anarchists, who plan to fire said lasers at L.A. Although the team and MI6 Agent Gemma are able to find the hacker fairly quickly, he sets his laptop on fire and flushes the digital password fob down the toilet and into the sewer system before they can catch him. Happy realizes that by flushing Toby's "Atta Boy" key-chain (which has a GPS tracker in case Collins shows back up for another kidnapping) down too, they can track where the fob is. While Cabe and Toby head back to the garage to try and break the hacker and Happy and Sly run support from above ground, Walter, Paige, and Agent Gemma go into the sewer system to retrieve the fob. They find the screen that should catch debris, but it's torn and the fob has continued its journey into the pipes, which conveniently fork in two directions. They're able to find where in the pipes the fob is by following its WiFi transmitter through Paige's phone's WiFi locator. Unfortunately, when they open the hatch to retrieve it, a rat gets to it first and jumps into a drain with it. This is also around the time Toby and Cabe get it out of the hacker that the laser target is nuclear. This narrows down the location to three places. So, as Sly and Happy race to the sewage treatment plant where the rat with the fob will end up, Toby and Cabe trick the hacker into giving them the exact location by threatening to dump him off right where all three potential fall-out zones intersect. Things are looking up for a rare second. But, Sylvester, who's leaning over the edge of the platform with a skimmer trying to catch the fob as it comes out of the pipe, falls over and into the holding tank, which has rotors under it to grind up anything solid. As Sly struggles to stay above water, stay away from the blades, and hold onto the fob, the team realizes that they're out of time to shut down the laser. In a seriously confusing and more-than-likely unscientific jump of logic, Walter decides to redirect the laser to where they are, so it follows the "Atta Boy" key-chain and strikes the motor (which has no munitions), thereby knocking off the motor, saving Sly and averting nuclear disaster. Back at the garage, Agent Gemma admits that the military laser wasn't actually the U.K.'s to begin with, and that by stopping the nuclear disaster, she also got the added bonus of having Scorpion steal the satellite for them. As Paige, who'd sensed that she wasn't being truthful, admonishes Walter, he admits that he actually took note of what she was saying, and programmed the satellite to spin into deep space just to be safe. Happy also asks Cabe to really open up to Toby during therapy, instead of just giving him the answers he wants to hear. And Ralph? Ralph presents Patty with an atomic watch, which gets him a prompt "Cool. Thanks kiddo!" -I busted out laughing when they were hit with the rotten egg smell and Happy wondered if Ray was back. - Walter suggesting to Paige they support Ralph instead of discouraging his crush on Patty so he doesn't end up socially clueless was sweet. -I don't know what I think of Florence yet. Like Paige in regards to Patty, I'm going to withhold my judgement for now. -Best quote goes to Sly - "There is not a chance in H-E-Double Wizard Wands that I am ever going down into the sewer!" What did you think of "Go with the Flor(rence)?" (Yes, I know I'm behind!) Is Cabe ever going to open up to Toby? Is Florence going to be sticking around? Let me know below!